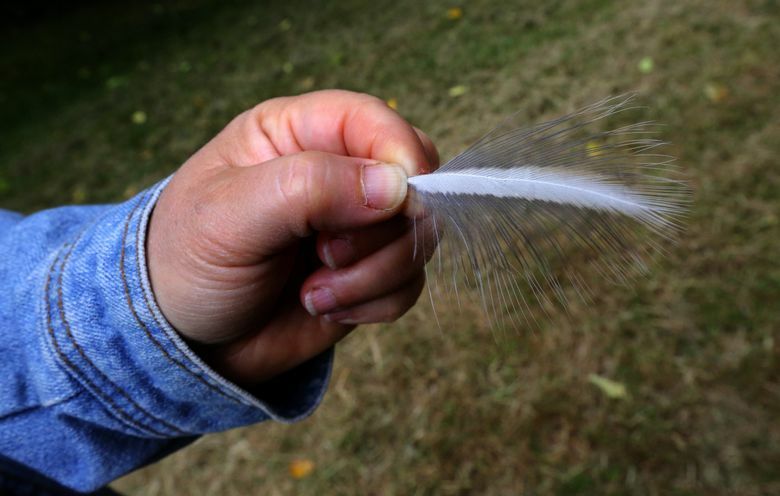 Tiny Commodore Park hosts Seattle’s biggest, newest heronry near the Ballard Locks. After a series of devastating eagle attacks where herons had been nesting, the colony abandoned all 86 nests and relocated. It’s the sounds that give it away: a steady clacking of bills, and raucous, prehistoric- sounding squawks. 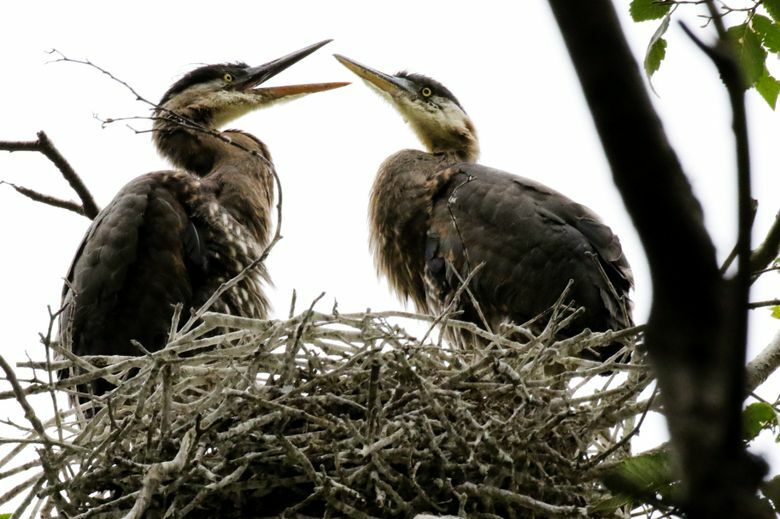 Seattle’s biggest, newest heronry is burgeoning with the city’s official bird, the great blue heron. 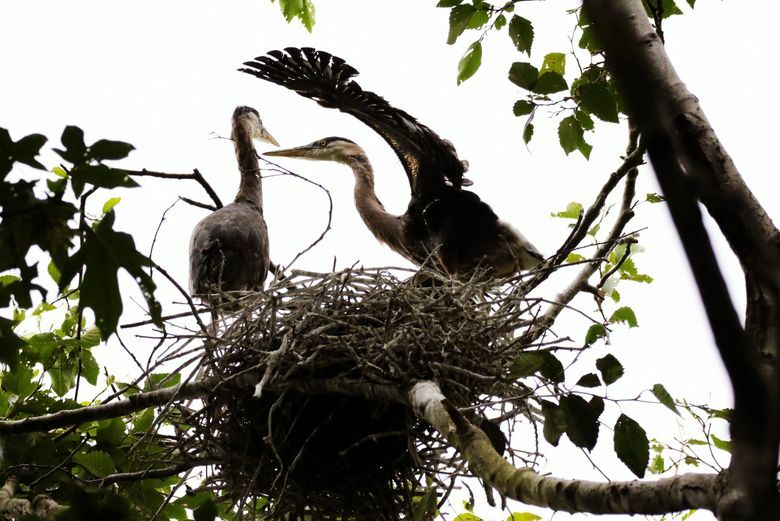 After a series of devastating eagle attacks in nearby Kiwanis Ravine, where herons had been nesting since at least 1982, the colony abandoned all 86 nests there and moved house to tiny Commodore Park. 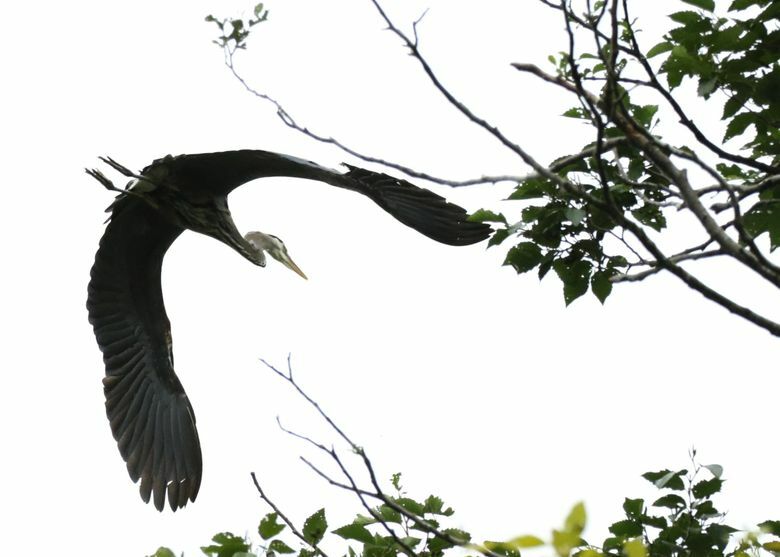 In just two weeks in May 2013, the herons added about 55 new nests to the seven already established at Commodore Park. Despite the late start — breeding season usually starts in January — the herons managed to raise and fledge 87 young in their new colony in 2013. Herons have continued ever since to use the alder grove at the edge of Commodore Park, where their nests are visible in the trees along the Ballard Locks on the Magnolia side of the water. The colony is so large, a look at the park from above on Google Maps shows the telltale cross-hatchings of the big nests made of sticks at the grove, like so many straw hats in the trees. 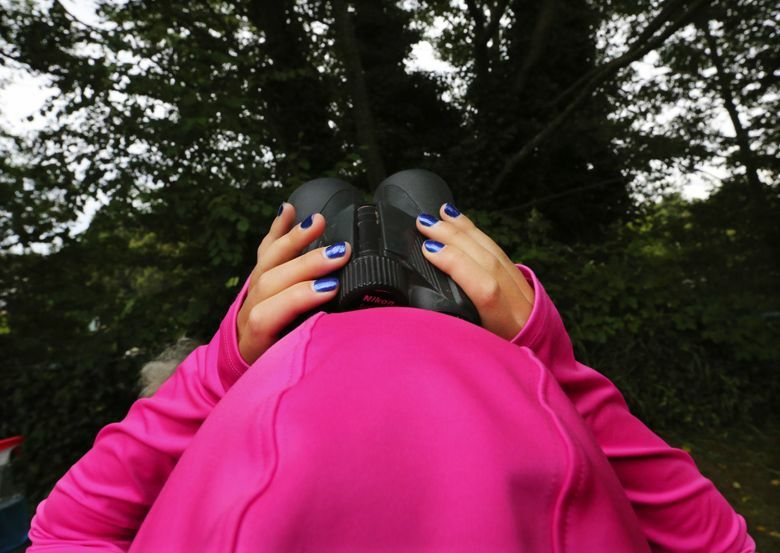 For the public, the heronry is an outsized helping of nature, right in the heart of the city. There are plenty of other heron colonies in Seattle, and the region. But this is the biggest aggregation of herons right in the city. They couldn’t have chosen a better spot for people to enjoy them. There’s free parking at Commodore Park, a picnic table with benches and a walking trail right under the nests. Volunteer observers with Heron Habitat Helpers keep a devoted watch over the heronry, recording the birds’ daily doings. 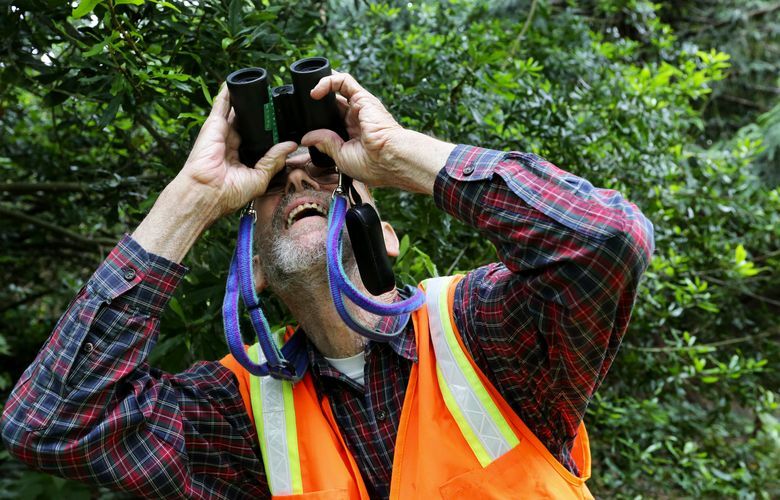 Mike Marsh, 83, regularly bicycles to the park from Greenwood to observe the herons. A biologist by training, he helps compile and keep the group’s meticulous records. About 111 chicks fledged from 59 total nests this year, Marsh noted. Of the 111 chicks, 20 so far were killed, 15 by eagles and five by their siblings or falling out of a nest. Some pairs are even raising new clutches in a second round of fuzzy mayhem in this tiny 3.9-acre park. Downy feathers drift to the ground, emissaries from the busy life above in the canopy. A sharp stink of guano scents the air. Herons have strange ways; they are sensitive to certain types of motion and noises. A drone flight over the locks caused every adult in the colony to flee in panic, fearing an eagle. A leaf blower also caused them to take flight. Yet the typical background noises of their chosen home — so close to the old one of decades’ use — don’t seem to bother them. Trains rumble by over the Salmon Bay Bridge. The lockmaster’s commands barked over a loudspeaker at boaters cut the air. Boats blast their air horns. No matter. The colony carries on. And what a carrying on it is, with all the rustling, feeding, flying and clattering of bills. 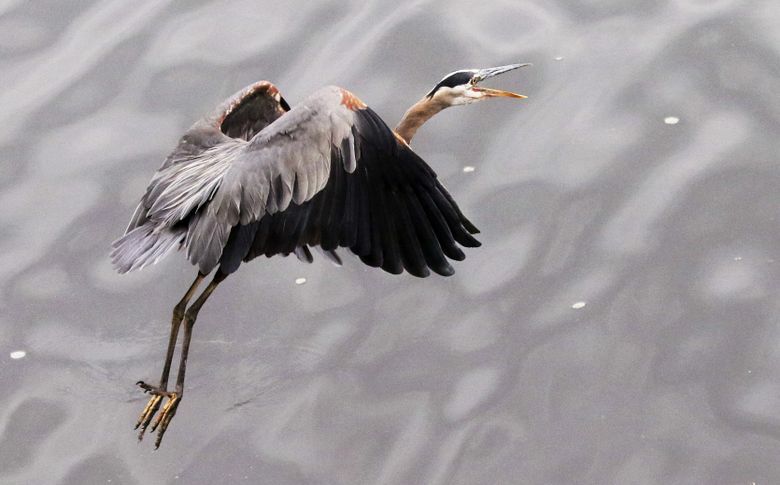 The herons’ nesting cycle begins in late January, as herons stage in the area. By February, they move to trees near the nests. By March, males begin selecting existing nests at the heronry and start scouting for mates. Theirs is a restrained approach: Males stand in the nests, warding off competitors, while waiting to be accepted by a female. Once the two form a pair bond, they get to work. The male collects and offers sticks to the female, who — if she finds the stick suitable — will accept it in her bill and weave it into the nest. 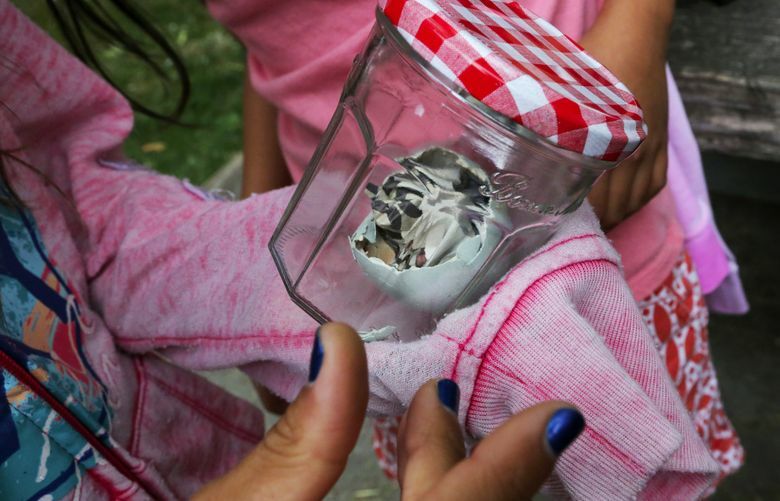 Nests are reused and recycled, year after year, growing quite large over time. Males and females take turns equally incubating the eggs and feeding the chicks, first visible in the nest just as a yellow bill peeking over the edge. By now, however, the chicks are typical adolescents: big and loud, and standing nearly as tall as their parents. By early August, most of the young will have fledged, and the nests will be empty until the cycle resumes in the new year. Herons can live as long as 20 years and typically will raise two to four chicks per nest from light-blue eggs the size of a chicken egg. They can swallow fish many times larger than their narrow neck and will hunt anytime there’s enough light to see. Standing 4 feet tall, their wing span can stretch to 6 feet. Yet they weigh only about 5 pounds. Their antics on the wing, the nest or water, have fascinated people always. On a recent afternoon parents and kids visiting the park passed binoculars and shared amazement at the nests just overhead. Debbie Jacobsen, another board member and volunteer heron observer, said she joined the Habitat Helpers at first just to meet new people but then fell in love with the birds.